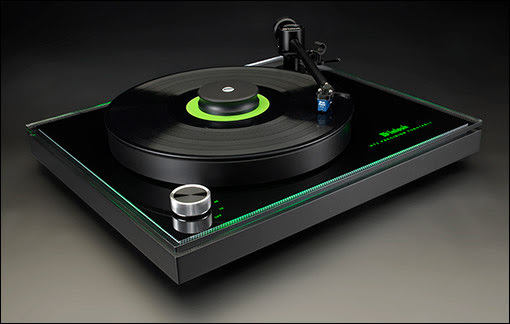 Noho Sound is thrilled to announce that McIntosh Labs has finally released their long awaited MT2 Precision Turntable. Scheduled to ship in April, the MT2 will retail for $4000. 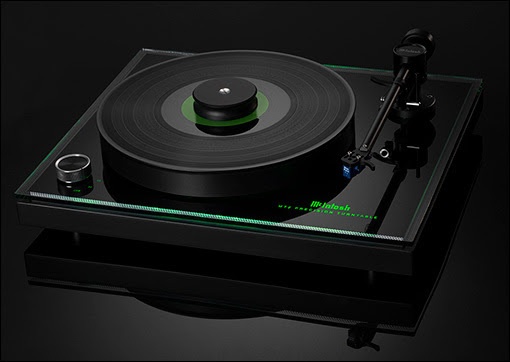 McIntosh is pleased to announce our new MT2 Precision Turntable. The McIntosh MT2 Precision Turntable combines the latest in turntable technology and design to deliver both superb performance and accurate playback. The MT2 is a great way to upgrade your home audio system to play vinyl albums. A full complement of features allows for all recordings to be reproduced with flawless realism. Its advanced electronic and mechanical design will give you many years of smooth, trouble-free operation. A subtle green glow emanates from under the platter and the outside edges of the plinth for a touch of refined ambiance and connection to the McIntosh design aesthetic. The MT2 comes with a moving coil cartridge that has a high enough output to make it compatible with not only moving coil phono inputs but also moving magnet inputs. The cartridge’s high impedance and high output voltage ensures noise free musical reproduction. This unique cartridge design features an alloy cantilever and an elliptical diamond stylus with exceptional tracking capability. The tonearm is constructed from dural-aluminum with special damping materials and is light weight yet highly rigid. The noise free vertical bearings feature two precision ceramic surfaces with damping fluid; the horizontal bearing is a gimballed sapphire design. The belt driven, solid black outer platter is made from a special dynamically balanced polyoxymethylene (POM) and is over 1” thick. This heftiness helps to both resist and absorb external vibrations that can cause noise during playback; its large mass also provides the perfect flywheel action for stable playback speed. The inner platter is made of CNC-precision milled aluminum. The platters rotate on a polished and tempered steel shaft in a sintered bronze bushing. The DC motor is driven by an external voltage-stabilized power supply and is completely decoupled from the chassis, isolating your records from any mechanical interference. Its sturdy plinth has a resonance optimized and highly compressed wood base with black lacquer finish, while the top and middle acrylic plates help absorb unwanted vibrations. A clear, contoured dust cover is included. The MT2 turntable is compatible with a variety of McIntosh phono preamplifiers, stereo preamplifiers, integrated amplifiers and home theater processors with phono inputs; virtually any of our amplifiers and speakers can be used to complete your audio system. Want to hear the McIntosh MT2 in downtown NYC? Call or email Noho Sound for an appointment. If you're wondering why Noho Sound went silent for a few days on social media, it's because co-founder Alex Roy was a little busy setting another Cannonball Run record, this time in a Tesla Model 3. Here's the article over at The Drive. Why did we open Noho Sound & Stereo? Stereophile was kind enough to publish this interviewwith Ron, Chris and myself, where we go deep into our vision for rebooting audio, events, and the experiential aspect of live and recorded music. Basically, if it isn't fun, what's the point? It's not very often—actually, it's almost never—that you hear about a new hifi shop opening, so I sat down with co-founder/CEO Alex Roy, president Ron Kain, and co-founder Chris Petranis to hear their take on where the industry's going, how they plan to attract millennials, and why they're starting a new venture in a market so deeply set on discussing its own decline. Aside from all having extensively worked as hi-fi salesmen in New York, Alex is the editor-at-large for The Drive, co-host of the show Drive on NBC Sports, and has set eight Cannonball Run Driving records in the USA, Sweden, and Spain; Ron has origins in pro-audio and was consistently the top salesman at NYC hi-fi retail giant Stereo Exchange; and Chris is a restaurateur, real-estate developer, and film producer. With a crew like this, it's no surprise that NoHo Sound has already been mentioned in Billboard despite only having been officially open for a few months."